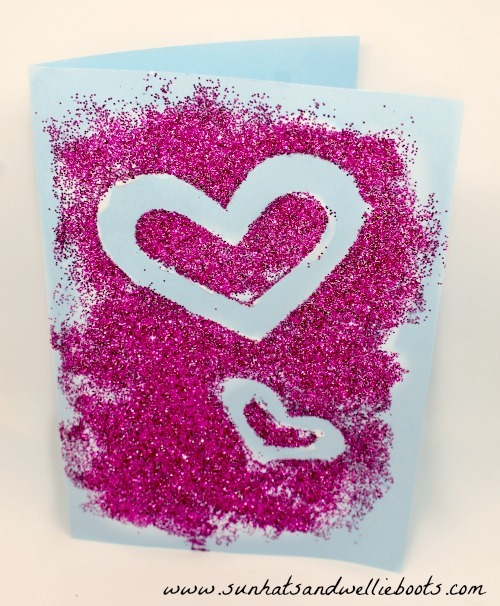 Add a little sparkle to someone's day with one of these gorgeous Valentine cards made with bio-glitter. 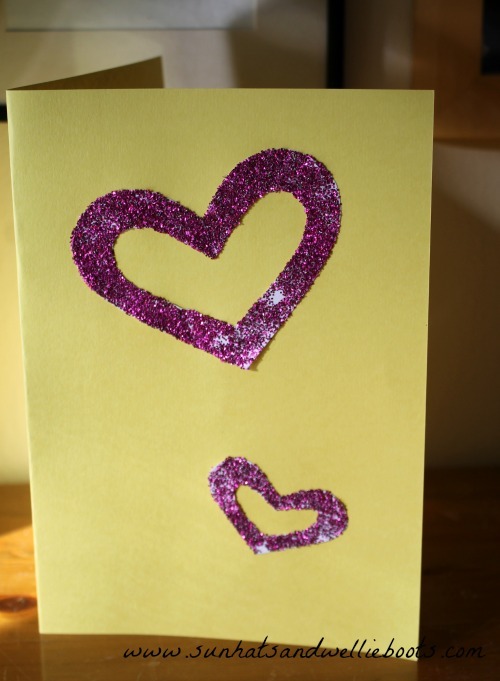 A few years ago we made some beautiful Valentine cards using paint dabbers (I'll add a link to them at the bottom of this post) & this year we thought we'd use the same technique but experiment with glitter & glue. These are ideal for any age to create, all you need is gloopy glue, a large paintbrush, some bio-glitter (we used bio-glitter shakers which we got from Brain Clegg Ltd), coloured A4 card & some Blu Tack/sticky tack. To make a symmetrical template we cut out heart shapes from a folded sheet of card, then cut another heart shape out from the center. 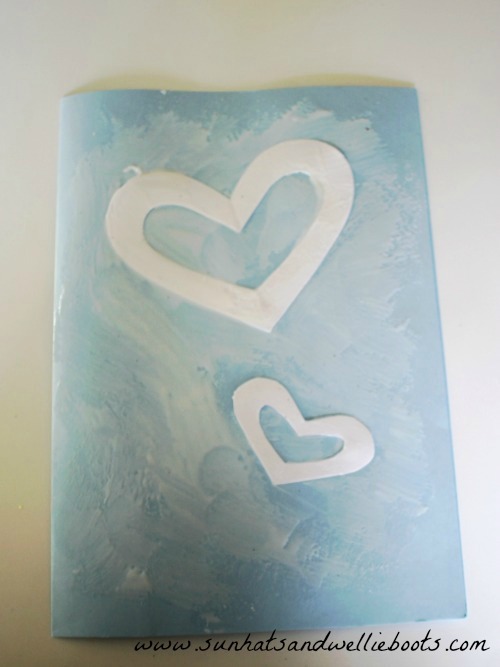 Using the Blu Tack we attached these to a folded piece of card which would become our Valentine's card. Top Tip: make sure the edges of the template are well sealed with the tack to prevent the glue from seeping underneath. Then came the fun part, sprinkling the glitter all over the card & then shaking off any excess. 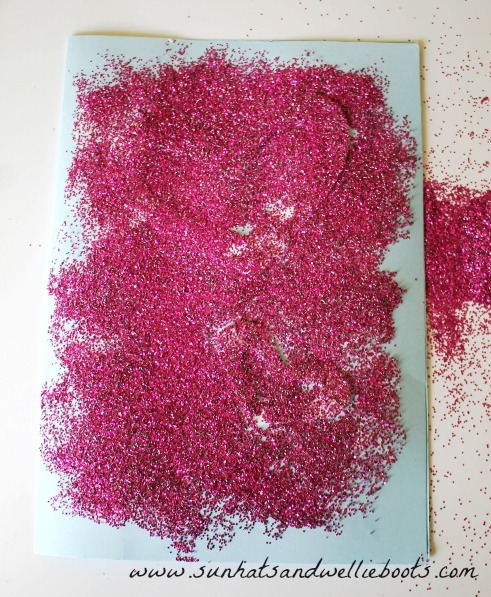 We left the remaining glitter in a pile to scoop up & reuse for another craft. I love this bio-glitter, not only is it gorgeously sparkly, but the fact that it creates less of an impact on the environment is a winner with me. 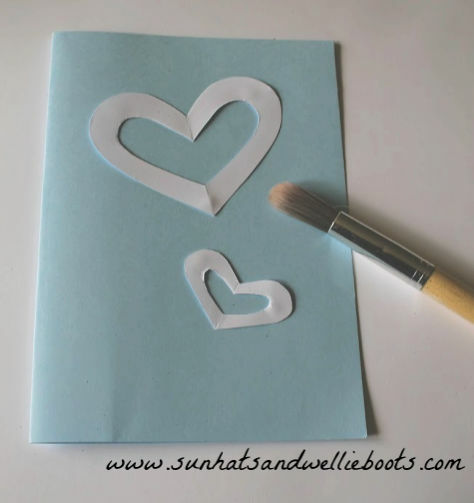 Without wasting too much time & before the glue had time to dry, we carefully peeled off the heart templates from the card. This can be a little tricky as the glue is still wet & your hands may get a little sparkly, but if you remove them quickly they're less likely to stick the card. When we removed our templates some of the Blu Tack remained on the blue card, but we simply removed this once the glue was complelty dry. 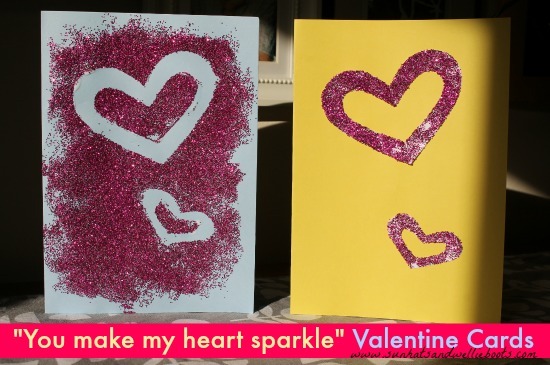 If your heart templates survived the process you could use them to create another sparkly Valentine's card. We added the message: "You make my heart sparkle" to the inside of our cards ready to send to someone special. I think these would look gorgeous in a frame too, such a pretty keepsake to decorate a wall with a little bit of bling. Every day should have a little sparkle in it, right? !